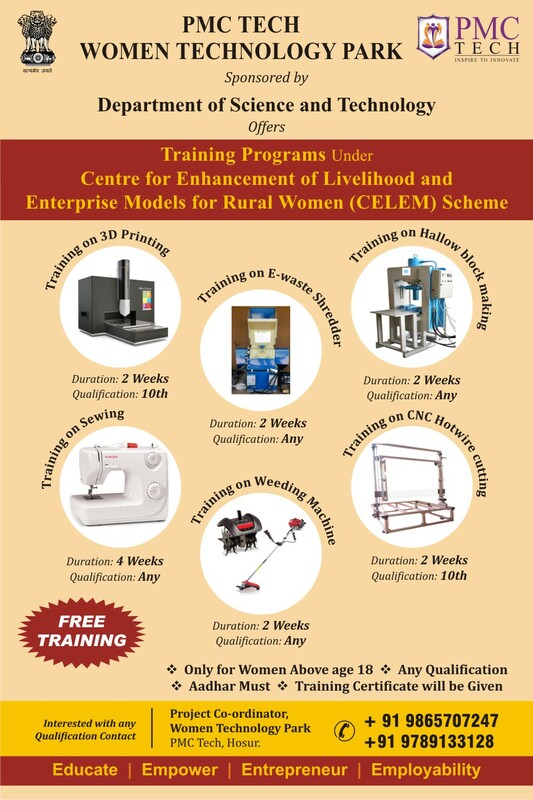 Women Technology Park at Er.Perumal Manimekalai College of Engineering is a Centre for Enhancement of Livelihood and Enterprise Models for Rural women (CELEM) in Shoolagiri Taluk supported by Department of Science and Technology , Ministry of Science and Technology, Government of India. To facilitate economic and social empowerment of rural women thorough trainings on proven technologies and demonstration of live technology models on priority areas, support them in setting up micro enterprises for sustainable livelihoods. To empower women through inputs of science and technology.